Hockey training products for ice hockey players and coaches designed to help players get faster, stronger, more explosive, and better conditioned, quickly! 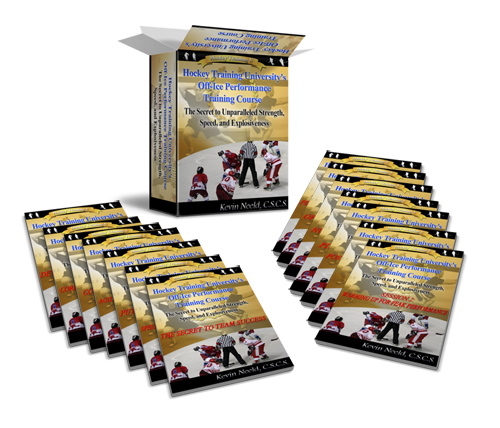 Quite simply, this is the single-most comprehensive hockey training resource ever created. Ultimate Hockey Training outlines an entire off-ice hockey training system, providing instruction on what players at different ages need to do to exceed their potential, and how to alter training throughout the year to maximize progress, while preventing burnout. You’ll never need another hockey training product after this! This is the ONLY site where you can get personal access to the world’s top hockey strength and conditioning coaches. Each week, the world’s leaders in hockey training post unique exercise videos, game-changing articles, and the exact training programs they use with their players. Have a question about your training? Just hop on the forums and one of our coaches will personally answer it! Hockey Training University’s “Off-Ice Performance Training Course“ is the first product on the market geared toward helping hockey players and coaches of all age-levels and abilities design and implement effective off-ice training programs. This incredible resource includes three FREE bonuses (valued at over $250! ): “Complete Hockey Nutrition and Supplementation”, “The Secret to Team Success Guide”, and 1-Week Pre-Season Training Guide. Breakaway Hockey Speed is a 25-page manual that outlines how to change your body position to maximize the power of your stride and reveals the truth about which stride pattern is better: short choppy strides vs long powerful strides (this will surprise you!). Breakaway Hockey Speed includes 6 Linear Speed Drills, 15 Transitional Speed Drills, and the information you need to integrate a comprehensive speed training program into your current training program. This manual is exactly what you need to become faster and more explosive on the ice! Speed is your 1st key to ice hockey success. Best of all, you can now get access to Breakaway Hockey Speed for absolutely FREE!